John Kreitzer is a researcher and investor in silver hydrosol technologies. Hello, my name is John Kreitzer. I’m very excited today because we have in the studio one of America’s leading natural healing experts, Dr. Leonard Horowitz. He is an outspoken critic of BigPharma and their medical monopoly. He has written and lectured globally on the dangers of vaccinations. He has sixteen books explaining ways people of all ages can heal naturally, safely, effectively, and inexpensively as prompted by natural immunity, He says people can combat nearly every disease from colds to cancers with simple lifestyle changes and by learning about hyrogen and oxygen in water. These are the main ingredients, along with silver, of an amazing new product he is here to tell us about. Besides testifying before the United States Congress on the toxicity of vaccinations, concerned about the brain damage, autism, and hyperactivity disorders affecting more and more children from injurious injections of mercury in vaccines, Dr. Horowitz is an internationally esteemed speaker and author of Healing Celebrations: Miraculous Recoveries Through Ancient Scripture, Natural Medicine & Modern Science detailing powerful ways to use water, and its elements, hydrogen and oxygen, for better health. It turns out that NASA scientists have been helping to develop this field to benefit astronauts. Dr. Horowitz is here to share how this new technology can help you too. This unprecedented discovery—“evolutionary” new products called silver oxygen hydrosols—may eliminate the need for vaccinations and antibiotics altogether. OXYSILVER™ is leading the field of silver oxygen hydrosols. These nutritional solutions promote natural immunity against everything from colds to cancers, and work energetically to destroy BigPharma’s biggest money makers. Dr. Horowitz is credited for saving hundreds of thousands of lives worldwide by writing and speaking out about the risks of “medical madness,” as he calls it, debilitating drug side effects, and ways to get yourself off dangerous drugs naturally and safely, saving money and maybe your life. Recently, you may have watched Larry King LIVE on CNN explain that the government now admits that vaccines may be causing autism and other mental health problems in children. Dr. Horowitz followed that broadcast on national radio speaking to 7 million listeners on Coast to Coast AM with George Noory explaining why the government is suppressing the worst of their mercury findings. Dr. Horowitz’s works are extremely controversial. Some United Nations AIDS officials have tried to censor Dr. Horowitz’s scientific publications and determinations. Beyond his degree in dental medicine, his is a naturopathic doctor, a doctor of missionary medicine, and a Harvard graduated researcher in public health who says you can reverse autoimmune diseases and effectively treat diabetes and obesity simply relying on water science, lifestyle change, and electro-chemistry. The drug industry would like nothing better than to see him censored or killed, and he has had several threats and attempts on his life. We have a very controversial show to bring you, so let’s get started. HOROWITZ: Good to be here, John, it’s a privilege and honor to be here. For people who are not familiar with your amazing and controversial work, you have three doctorates, one in dental medicine, one in naturopathic medicine, and one in missionary medicine. And besides getting a Harvard master’s degree in public health you have published dozens of scientific peer reviewed publications, sixteen books including three national bestsellers, and three documentary films, including In Lies We Trust: The CIA, Hollywood & Bioterrorism, and your latest, PHARMAWHORES: The SHOWTIME Sting of Penn & Teller, is that right? HOROWITZ: That’s right. I’ve been pretty busy. And you have a wonderful family, I understand, with three healthy and talented children who have never been vaccinated against anything, and haven’t even taken an aspirin, ever, for any ailment, right? HOROWITZ: That’s right. We use a variety of natural healing methods that work far better than any drug or chemical elixir. People just don’t know how simple and inexpensive healthcare can be because drug industrialists that control medicine and medical education, with revolving doors to government health agencies like the CDC and FDA, have a vested interest in keeping people profitably ignorant, sick, and enslaved to drugs. In essence, we have an American Medical CULTure, that has educated us into ignorance about who we are, how we heal, and what disease really is so that people keep popping magic pills to cure every ill and remain enslaved to pharmaceutical profiteers. Now wait a minute. Aren’t doctors caring people? Aren’t they intelligent enough to know there are safer, effective, more natural and less expensive ways to cure diseases? You don’t recommend going to medical doctors do you? HOROWITZ: I recommend doing the right thing. I do not recommend people go to hospitals or doctors most of the time, with surgeons and accidental emergencies being the exception. Healing occurs naturally, and you don’t need toxic drugs to induce it. That’s mostly what doctors do—prescribe drugs for every ailment; drugs that cause more ailments from toxic side effects. That makes more money for doctors and drug dealers, and causes more human misery than anything. But if you’ve got broken bones from a traumatic injury, it’s wise to get a great surgeon to put you together. That’s a completely different matter than claiming lives in a system of disease induction we mistakenly call healthcare. Aren’t there any good drugs? HOROWITZ: Sure, if you’re a drug dealer or want to be a drug addict. Then there are great drugs. But the entire approach to healthcare is flawed by one central fact. Healing is a probiotic process, a probiotic dynamic. Modern medicine is almost always anti-biology. Anti-biotic addiction is a CULTural mind-set and social affliction. KREITZER: And you say the media has a lot to do with this, don’t you? HOROWITZ: You bet. Television is a hypnosis machine. Watch people watch TV. They don’t blink. “Relaxation and a clear channel for communication” is the strict technical definition of hypnosis. Why do you think drug commercials, on prime time television, very expensive time, spend 10 of 60 seconds disclosing the dangers of drug side effects? Not because the Surgeon General demands it, or legislation requires it. It’s because more people are hypnotized into thinking a “normal life” involves popping magic pills that don’t cure the underlying causes of disease, but cause new and even worse diseases that require more magic pills to be popped. The drug dealers like it this way. It is literally the great American Medical CULTure being engineered in your own home on TV backed by consumer demand! And that word says it all—CON-SUM-ER—the sum total of this “ER” (Emergency Room mentality) is a con! Besides that, drugs are unloving, uncaring, and insensitive to real whole people. Doctors generally follow suit. They become this way from the pressures of “training” and “practice.” Sure they think they’re doing the right thing. They think they are serving their patient’s best interests. But what they are really doing is acting as virtual Manchurian Candidates for drug industrialists that promise you relief and give you grief. KREITZER: Now Dr. Horowitz, you say you have a better way. Tell us a little about your 5-steps to natural healing and how each step is administered by using a new product you are recommending called OXYSILVER™. HOROWITZ: Sure John. The five steps I recommend in my second national bestselling book, Healing Celebrations: Miraculous Recoveries Through Ancient Scripture, Natural Medicine & Modern Science, include 1) detoxification using primarily water spiked with fresh squeezed lemons or limes, a bit of cane juice (ideally fresh squeezed) or grade b maple syrup, and cayenne pepper; step 2) (is) de-acidification again using water and the power of hydrogen’s electro-chemistry, to adjust the body’s chemistry making it more alkaline. In the alkaline state you get rid of nearly all chronic diseases. Plus cayenne pepper is one of the most alkalinizing agents you can put into your body. It also acts like Roto-rooter for the cardiovascular system; step 3) is boosting or normalizing natural immunityholistically; including energetically. This is where personal responsibility comes in―caring for yourself physically, mentally, emotionally, socially, environmentally and above all spiritually; Step number 4) (is) oxygenation. Oxygen, in water and air, is the most miraculous healing element in the periodic table of elements. Combined with hydrogen in water, it gives us the chemistry of Divinity. That’s right; you heard me clearly—the chemistry of Divinity. If you study the Bible, and I am not a religious person, but I study the Bible, the Book of Genesis records in the beginning there was the Creator, and the Water, even before there was the word. Or even before any sound was spoken or sung, there was the Water—the miraculous Creative Juice. The word, sound, or frequencies of energy placed by the Creator into the Creative Juice—Water–created everything in the universe including people. Properly hydrated, you are more than 80% Water. That means you are 80% Creative Juice that transmits a spiritual energy that can be relied upon to heal you and sustain you. Just think about this oxygen element, number 8, the infinity sign, for a minute. Oxygenation therapies have been heralded, even by mainstream media, as producing miraculous benefits. Even Peter Jennings on the ABC News showed paraplegics going into hyperbaric oxygenation chambers, and coming out with their nerves and muscle functions amazingly restored. Medical ozone, three oxygen atoms combined, kills germs on contact. This, along with ultraviolet light, which is simply a frequency of colored energy, is used in the best most-expensive water purification systems because it kills bacteria, viruses, and fungi. How God got Adam off the ground, says the Bible, is he breathed the breath of life into him. Respiration—re-spiritualization; inspiration – bringing that Holy Spirit power of life into you—is what experts worldwide recommend for everything from meditation to remediation of diseases. I had an elderly colleague and friend who recently passed away. His name was Basil Wainwright. Basil dedicated his professional career to researching oxygen’s health benefits. He, like me, was persecuted by medicine’s mainstream; black-listed from giving professional organizations lectures; prosecuted by the U.S. Federal Government’s FDA–Fraudulent Drug Advocates–and compelled to leave the United States to continue his research. He was invited to Kenya by the past president of that country to establish an experimental AIDS clinic that I visited. I interviewed a dozen fully recovered AIDS patients there who had simply received polyatomic oxygen fed intravenously. That proved to me the incredible healing power of simple oxygen, suppressed by our government and the drug industrialists our politicians serve as prostitutes. Now oxygen works miraculously because of the healing dynamics of step 5) Bioenergetics. Biology’s fundamental energy comes from hydrogen that donates electrons. This is the fuel for moving your physical body. Chiropractors know this. Acupuncturists know this. Educated spiritualists know this. And physicians who use Nuclear Magnetic Resonance Imaging machines see this truth operating daily with every patient. The animating principle of life is vibrational energy or resonance. You are a part of life. So you can best treat yourself vibrationally, bioelectrically, or bioenergetically, that is, biospiritually. These are all the same, and you get the same beneficial results—miraculous healings. This is how prayer works. And sound, color, and light therapies work. It is why certain music made with 528Hz tuning is so powerful, especially when applied clinically for healing; and why frequency therapists and pioneers like Royal Raymond Rife had their technological advancements suppressed. Even to this day, Big Pharma, the drug-lords, and their puppet politicians are suppressing the knowledge that life is energy and energy creates life. Basic energetic processes involving hydrogen, oxygen and water, produce every healing. KREITZER: Now you helped develop a product called OXYSILVER™ that helps all five of these steps for getting and staying healthier. Tell us about it. HOROWITZ: Okay. OXYSILVER™ is a trace mineral water that is unlike any other silver product ever produced, any broad-spectrum health aid in existence, or any energetic solution ever developed. Very simply, OXYSILVER™ is a suspension of electrically charged silver atoms prepared by lasers in a special reactor* that is ionically energized and combined with oxygen in a most unique way. That is, the two elements, silver and oxygen, are covalently bonded―the silver atoms are tightly linked to the hyper-energized oxygen atoms. What’s entirely unique about these new oxygen-silver hydrosols is that theoretically they can help (FDA Censored Words) and xxxxx any xxxxx affected by oxygen, which includes the vast majority of xxxxx from xxxxxx to xxxxxx. OXYSILVER™ is leading this group of new silver hydrosols. It is an energy-delivering, oxygenating, alkalizing, 528Hz frequency resonating formula that was first developed and tested by NASA scientists for space missions without some of the latest advances in the formula. They used it successfully for sustaining life in space under hypoxic conditions wherein vital oxygen levels are critical and water purity is essential. Moreover, OXYSILVER™ can be used outside the body, in your environment, your house and workplace, completely safely and highly effectively. All silver-oxygen hydrosols are excellent surface disinfectants. Studies show their use this way produces far safer, less toxic, disinfection than leading commercial or household disinfectants. . . , which are of course harsh and severely damaging to human health and expensive equipment. So people can benefit tremendously by using OXYSILVER™ internally and environmentally around their homes and workplaces in places like nurseries, bathrooms, kitchens, surgical suites, and hospitals. The liquid can be sprayed virtually anywhere without causing any harm to even a baby or a pregnant mother. In short, OXYSILVER™ is a dietary supplement that makes your body very inhospitable to BigPharma’s leading money-makers. All of this awesome activity is done bioelectrically, or bioenergetically, using only three natural elements: hydrogen, oxygen, and silver, the later two covalently-bonded in pure water so that we have, energetically and vibrationally, a double superconductor–the silver and the water–creating a super-charged liquid with beneficial, homeopathic-like, frequencies including the good vibration of LOVE. Coupling the “Universal Healer”–LOVE–with the “Universal Solvent”–water–along with the “Universal Language”–music made in the 528Hz frequency tuning, is humanity’s greatest hope for terminating BigPharma’s stranglehold over biology and destruction of our ecosystem. 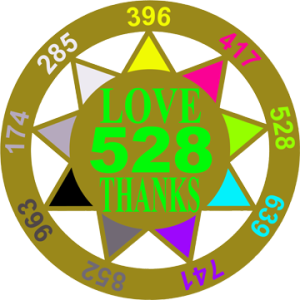 The precise sound of 528Hz is a powerful healer and sustainer. So we started putting that into OXYSILVER™ to simply make people feel better, more loving, lovable, healthy, whole, and energized. KREITZER: Dr. Horowitz, that’s incredible. Is there any legitimate published science to back up these claims? HOROWITZ: Yes. In fact, there have been numerous scientific studies spanning two decades that tells us more about water resonance and the oxy-silver hydrosols. There are many beneficial claims we could make if we were allowed to state these facts on television or in print, which we are not allowed to do due to the genocidal suppression of science and scientific facts regulated by the FDA and FCC. These agencies act like the Gestapo for BigPharma backers who are literally the “banksters” behind every war and plague that has emerged over the past century. But here’s something else that I can tell you. . . . The old-money “banksters” are considered “Blue Bloods.” Silver has been used by them for thousands of years as a preventative against plagues—the world’s most deadly infectious diseases. KREITZER: Yes. I have heard this before. HOROWITZ: Most well informed people have. . . . The royal families and wealthiest aristocrats were called “Blue Bloods” because they would always eat with real silverware! As they ate, the silver would leach off their utensils and into their mouths, foods, and water. In essence, they were consuming trace amounts of silver as a nutritional supplement that turned their blood more “blue” and provided broad-spectrum anti-microbial protection against infectious diseases. That’s a main reason why, besides better nutrition and less stress, the “Blue Bloods” stayed healthier than commoners they treat like cattle. KREITZER: Now, I’ve heard a lot of people have been taking colloidal silver solutions, which are widely sold over the Internet and in natural foods stores, which may cause people’s skin to turn blue when used daily. Is this the same? HOROWITZ: No. Not at all because of the unique process in which the silver, in OXYSILVER, is reduced in size and held in solution covalently attached to oxygen. All of this is accomplished by this new reactor* technology originally developed for space missions, where, in space stations and shuttles, the astronauts needed more oxygen and pure water to stay healthy. Scientists realized oxygen, and energy-enhancing anti-microbial silver, could be combined to keep the astronauts healthier, more vibrant, better rested, and optimally hydrated. The colloidal silvers that people are taking I have been lecturing on for many years. I have always warned people not to take these daily because of a well-known accumulation of silver that ends up in cells and tissues turning the skin blue or silver-looking. This is called argyra. It makes people who don’t heed this advice look like the tin man in the Wizard of Oz. So while colloidal silver solutions have helped many people, when judiciously used in moderation against infectious diseases, these products cannot compare with OXYSILVER™that uses micro-fine silver particles boned to oxygen. OXYSILVER™’s particle size so small you can take it daily without worry of argyra or any toxicity in the low doses we are successfully using and recommending. By the way, anything can be toxic if abused. Pure water will kill you if you drink too much too quickly. Another important difference is that the silver in colloidal silvers falls out of solution because the particle size is so large and so heavy. This never happens with OXYSILVER™ because the silver particles are so much smaller, and more importantly, they are covalently, or electrochemically, bonded to the oxygen in the water molecules. This is amazing and unprecedented in science. People can use this technological advancement for better health and natural healing. Silver is the safest, and aside from copper, the most electrically conducted element in the periodic table of elements. Combined with oxygen, the power is really awesome. KREITZER: And, Dr. Horowitz, there are now copy-cats in the marketplace that are selling colloidal silver products, claiming they are high quality silver hydrosols, and claiming they carry helpful frequencies, but they lie, right? HOROWITZ: You be they do, John. And people need to beware. One of OXYSILVERS newest competitors has received a great amount of publicity through the Alex Jones show, and Genesis Communications Network. Alex was advertising and recommending OXYSILVER; then suddenly his staff refused to take our advertising money. We found out they struck a deal with a competitor that claimed to have a silver hydrosol resonating at the frequency of UltraViolet light. The problem is, UV light has been scientifically proven to cause DNA damage and skin cancer. Beyond this, the “germicidal” frequencies they advertise using–890-910THz– are far beyond the UV frequency range! I had never seen electrons in electron microscope photos that looked like this. I never saw perfectly hexagonal ring displays like this. But the six electron ring, a shape that Dr. Masaru Emoto and I largely made famous by our combined research in water structuring and 528Hz frequency crystallography, so I researched further. I discovered this photo appears to be a doctored-fraud. Alternatively, the photo below is one of the latest most advanced electron microscopic photos of a carbon atom, much smaller than a silver atom. And yet, as you can see, there is no clear definition of electrons arranged in a hexagonal ring, even though this is Carbon-6 atom, wherein you might best see this hexagonal shape that forms the basic structure for organic chemistry. KREITZER: So, Dr. Horowitz, if I understand correctly, OXYSILVER™ is the most advanced silver hydrosol for a number of reasons, right? HOROWITZ: Right, John. Let’s start with OXYSILVER™‘s surface charge. Here is one of dozens of scientific reports detailing how and why pathogens, disease formers and deadly germs, have negatively charged surface membranes. These are their weak spots. Destroy their membranes’ negativity, and you destroy them like light dispels darkness. As this paper from the Laboratory of Microbial Structure and Function, and Electron Microscopy Branch, Rocky Mountain Laboratory, National Institute of Allergy and Infectious Diseases, and the National Institutes of Health states “bacterial cell surface negativity emanates from neuraminic acid moieties on capsules or . . . side chains and from sulfate-bearing polymers that may accrete to the bacterial surface.” This was published in the Journal of Bacteriology in June 1997. In other words, science has long recognized there is a negative electro-chemistry associated with the surface coating of the vast majority of dangerous and deadly germs. This is an Achilles heal in germ warfare, both microbiologically and politically. How long will it take before the world realizes fighting and killing off deadly germs, from HIV/AIDS to the Avian Flu, is simply a matter of directing energy, the right charge, to the right place? Changing the energy polarity of germ surfaces with OXYSILVER™ is safe, effective, and far less expensive than antibiotic drugs that produce toxic side effects and cause germs to mutate developing dangerous resistance that jeopardizes the global village―the whole of humanity―as well as other species. Here is where OXYSILVER™ shines. The molecules of specially charged oxygen in the water act like little Robin Hoods, stealing this negativity from the germs that lose their negative charges by the billions. The germs don’t like that very much. It’s like stealing evil’s negativity. So just like light, dispelling the darkness, the positively charged oxy-silver, especially element 8, kills the menaces on contact leaving your body empowered to spend its energy and immunity doing better things in life than fighting germs, such as fighting cancers. And nearly all cancers hate oxygen. They don’t grow well in it if they grow at all. So OXYSILVER™ helps on this front as well as more soluble oxygen is released into the blood after the charged silver/oxygen clustered molecule steals millions of electrons from millions of germs. In fact, once your body is free of this immunological energy drain, you are far more vibrant to fight off other charged substances that cause cancer and premature aging, called free radicals. Free radicals are most commonly blamed for most diseases, including cancer, heart disease, and many others. Here [inset] is a simple explanation of a complex subject about oxygen’s involvement in free radical formation and free radical elimination from an avid researcher in this field, Karl Loren. “A free radical has an excess of positive electrical charge (because there is one less electron in its rings) and that means that this free radical is able to attract an electron from some other atom or molecule. This “taking” of a free electron from somewhere else means that the free radical is now balanced and is no longer a free radical. “A charged atom (or group of atoms) is properly referred to as an ion. “A free radical is a species bearing an unpaired electron. “Free radicals have no charge; they are electrically neutral. “However, radicals are very reactive because they seek to complete the electron pair. “Thus, they can attack other molecules. Therein lies the danger to living systems. “However, the atom or molecule from which the electron was taken may now, itself, become a free radical, or may be damaged in some way. “One of the primary types of damage caused by free radicals traces back to radiation. In other words, sunlight, x-rays or other radiation hits the body and creates free radicals inside the body. These are free radicals, which, in turn, grab some loose electron from somewhere, and thus create a new free radical. . . .
“Free radical biology is closely related to radiation biology since 70-80% of the effect of radiation on cells is due to the production of free radicals. The study of free radicals has become of extreme interest because of the role of free radicals in a large number of diseases and pathological states. As examples, cancer, aging, heart attack, stroke, diabetes, and Lou Gehrig’s disease all have a free radical component to their mechanism of injury. The use of free radical modulators (like Vitamin C and Microhydrin) in the prevention and treatment of these diseases is under close investigation at this time including clinical trials. “Research in free radical biology is quite interdisciplinary. Research ranges from studies of the fundamental chemistry of free radical reactions, to antioxidant enzymes (their biophysics, biochemistry, biology and molecular biology), to free radical pathology, to even epidemiological studies. It is a broad area of research with many opportunities. “All cells in the body have a “skin” or “membrane” as an outer shell. This is the shell which contains all the components of the cell and which allows the cell to exist as a separate living entity. “This membrane is mostly made of cholesterol — a very important building material used by the body. The cell uses cholesterol, and in fact can even manufacture cholesterol, to build the cell membrane. “Cholesterol, itself, includes oxygen as part of its chemical make-up. This oxygen, usually, is in the form of oxygen atoms which each have those stable EIGHT electrons going around the nucleus. “In a loose sense you could say that the cells in your body are made with a skin of fat — since cholesterol is just a name for a particular type of fat. “Fat is particularly vulnerable to being damaged by free radicals. The damage is typically caused by some free radical hitting the membrane of the cell and “stealing” one electron from some atom of oxygen in that membrane. “As more and more free radicals hit the membrane of a cell, and as more and more of the oxygen in the cholesterol get “oxidized” that cell wall, the membrane, becomes less and less able to function as it should. “Well, that cell membrane has to allow water and nutrients to enter the cell, and has to allow the garbage and waste products of the cell to leave the cell. Both of these actions mean that the membrane allows passage of materials (mostly water with other stuff included) to move through it. If the membrane is damaged by free radicals, that “passage” may not work properly. “One consequence of this might be that garbage accumulates inside the cell and it dies in a sea of toxic waste! “Or, the cell may not be able to take in nutrients and it could starve to death. “These health problems for that one cell translate, as millions of cells are affected, to health problems you perceive in your body as any one of hundreds of different diseases. With OXYSILVER™, pure H2O is used containing two atoms of Hydrogen sharing electrons with one atom of Oxygen. In the first step, the reactor* initially used by NASA, now used by our private company to make OXYSILVER™, strips hydrogen atoms which contain 1 proton and 1 electron from the Oxygen atom. This yields positively charged Oxygen ions, each with a charge of +2. In step two, each of these +2 Oxygen ions seek to combine with two electrons from some other molecule. Simultaneously, step threeoccurs―the generation of supercharged negative silver ions (which usually have 47 electrons) with millions more electrons created by the reactor* (–1M to 2M). These electron “clouds” or “spheres” instantly grab on to these positively charged Oxygen ions and neutralize their positive charges. That is, up to a million or so Oxygen atoms immediately bond to each Silver ion by grabbing two of the millions of electrons from the Silver Ion sphere to share them tightly with the Silver ion. This unprecedented reaction and combination is the unique, “evolutionary,” covalent bond created for healing with OXYSILVER™. That aside, millions more Oxygen molecules do likewise―attaching to the Silver ion “cloud.” The result is a clear liquid trace silver solution with an indefinitely long, very very long, shelf life that retains its effectiveness regardless of exposure to sunlight or temperature fluctuations. OXYSILVER™ does contain other helpful trace minerals, but the Silver Oxygen covalent bond is the main attraction here, even though the Silver is concentrated to less than 5 ppm, which is very low. So now we are dealing with a positively-charged molecule, or more accurately, a molecular complex of Silver and Oxygen. It is not a positively charged free radical seeking an electron and in the process causing destruction to cells and tissues. The main difference is OXYSILVER™’s Oxygen atoms are no longer seeking additional electrons, but the molecule retains a positive charge on one side. So in step four, this positively-charged electromagnetism simply pulls on negatively-charged electrons on germs’ outer membranes; particularly on pathogen membranes with high electro-negativity, which most pathogens and oxygen hating (anaerobic) germs have. This destabilizes deadly germ membranes. In essence, disease-forming microbes get their negativity zapped and their cell walls degraded and destroyed. As a result, they starve, swell, and explode. As I mentioned, as millions of positively charged Oxygen atoms bond to each negatively charged Silver ion the overall charge of the OXYSILVER™ molecule becomes more positive. This is due to the ratio of positively charged protons in the nucleus of the Oxygen atoms. In total, they are greater than the number of electrons being shared amongst the other Oxygen molecules covalently bonded to Silver ions. Eventually, some of these Oxygen molecules drop off from this positively charged hydrosol cluster, especially when they take on electrons to balance their charge. But unlike free radical forming oxidation reactions, this natural release of oxygen from the hydrosol further helps to oxygenate the blood, cells and tissues. There is no better way to support natural immunity than to destroy its enemies―particularly viruses like the oxygen-hating AIDS virus that appears, in every way, to be man-made andvaccine-transmitted. So this technology is really revolutionary and timely, if not urgent. It comes at a most challenging time in human history; when “We the people,” and myriad other species, are threatened with extinction from diseases brought on mostly from laboratory mutations, petrochemical-pharmaceutical intoxications, and deadly vaccinations. Behind these risks lies greed, ignorance, and public silence. In essence, OXYSILVER™ is revolutionizing healthcare by providing a natural nutritional vaccine-free boost to immunity without immunization toxicity and without painful and poisoning inoculations. This claim is based on published science that shows the silver hydrosols are effective against nearly all pathogens and infectious diseases while also lowering the risk of chronic ailments due to higher levels of immunocompetence, oxygenation. and free radical destruction. too good to be true. Are you for real? HOROWITZ: John, pinch yourself. Do you feel it? OXYSILVER™ is as real as that. That’s why NASA scientists produce a similar product to protect astronauts in space. That’s why NASA scientists developed and make use of their oxygenated silver hydrosols to kill all the bacteria, viruses and fungi that grow in space labs. This is for real. This, OXYSILVER™ hydrosol will continue to attract negatively charged electrons found in hostile microorganisms, to weaken and destroy these germs. Hostile, gram-negative bacteria, viruses, molds etc. don’t stand a chance with their negatively charged electrons vulnerable on their surfaces. Once they contact the OXYSILVER™ molecule, its over. Because the OXYSILVER™ molecule discharges germs’: negativity, polarity, cell surface communicative ability, nutrient uptake, water balance, genetic expression, and more. The only thing people with severe, even life-threatening, infections need to prepare for is the die off of deadly germs in their bodies if these consumers of silver hydrosols are not well hydrated. This is called the Herksheimer reaction in medicine, and can become a “healing crisis” causing symptoms of toxicity if you are not well hydrated. The germs die off so fast that unless you excrete them out of your body and bloodstream, by drinking a lot of pure water to do this, then you can get a headache, fever, chills, or a rash. This is part of the natural detoxification process, and the reason every good naturopathic doctor recommends drinking half your body weight converted to ounces in good, pure, pH 8 adjusted drinking water daily. So if you weigh, let’s say, 200 lbs., you should be drinking 100 ounces―nearly a gallon of good (slightly) alkaline water daily. Now theoretically, there may be more good news about OXYSILVER™. As more and more germs lose their negativity and membrane polarities, and negative electrons are collected by Oxygen atoms in this water, cellular oxygenation levels may rise for two reasons: 1) there is less stress on the immune system, therefore, less usage of oxygen and less acidification throughout the lymph and blood, and 2) direct oxygenation and buffering of your body chemistry, increasing your alkalinity, additionally benefiting your immunity, and strengthening your resistance against diseases of all types from colds to cancers. So for all the right reasons, OXYSILVER™ is revolutionizing infection control, health science, environmental science, and consumer health care. People are really ready for this change. They are sick and tired about being sick and tired. They are sick to death about the inadequacies of healthcare, health insurance, public poisonings through the air we breathe, water we drink, and foods we eat. The environmental degradation and pollution and intoxication created by the petrochemical-pharmaceutical caret for profit is now intolerable. KREITZER: Dr, Horowitz, you are amazing. Can you sum this up for viewers? Successfully used on earth and in space. 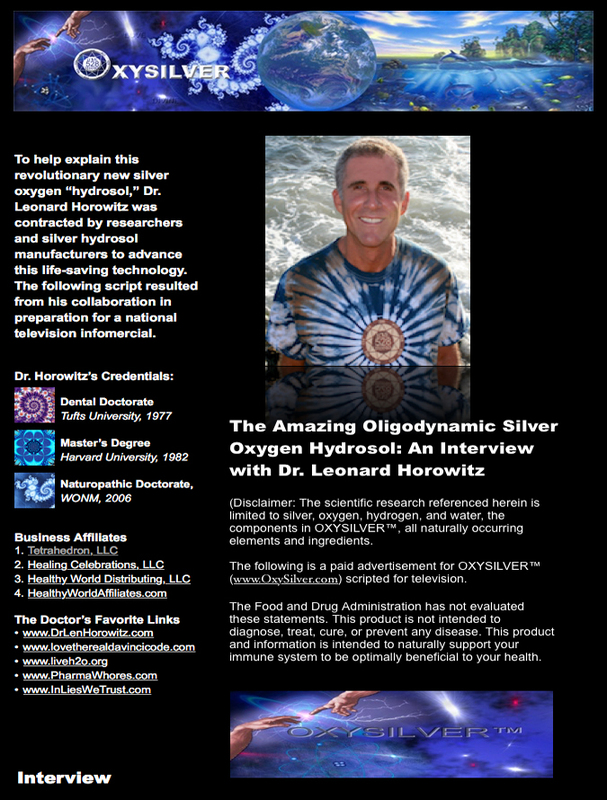 the silver oxygen hydrosols boast a 20-year track record with no harmful effects after use by thousands of people, many providing positive testimonies evidencing its efficacy far beyond colloidal silver, which some officials associated with the National Institutes of Health now report can be very effective in certain concentrations. 1)The Silver in OXYSILVER™ is permanently suspended by a revolutionary technology developed for NASA that creates covalent fusion between Silver and Oxygen atoms. 2)The Silver ions in OXYSILVER™ are held in permanent suspension by this covalence of many Oxygen atoms taking advantage of the electrons and charge of single Silver ions. 3)The orbiting electrons of single Silver ions in OXYSILVER™ wrap around the Oxygen ion as the Hydrogen atoms are being separated during a reaction process developed for, and tested by NASA. 4) At the present time OXYSILVER™ is manufactured using private propriety technology that governments have not made available to the public not for lacking science, but for malfeasance and corruption maintaining the petrochemical-pharmaceutical cartel’s stranglehold on people’s health and this planet’s well-being. 5)By treatment in a special reactor*, the Silver in OXYSILVER™ achieves a micro-fine particle size that aids in its even dispersion in water and continued suspension in this hydrosol. For these reasons, the Silver’s availability to reach deeply into cells and tissues is extraordinary. 6) OXYSILVER™ is a state-of-the art silver hydrosol. Doctors and patients can expect superior effectiveness using the entire class of these oligodynamic hydrosols as antibiotics or germicides leaving healthy cells and tissues free from harm. 7)OXYSILVER™ can be ingested daily, and safely, maintaining its excellent efficacy without risk of infectious microbes developing tolerance. This is a huge problem, and worldwide threat, with medically prescribed antibiotics. 8) OXYSILVER™ maintains an extremely long shelf life, and is not degraded by light or temperature, making it ideal for use in developing nations, especially for indigenous populations that have traditionally relied on more natural methods of healthcare. 9)OXYSILVER™ moves easily through cells and, like any nutrient, through the intestinal wall. This minute particle then travels through the bloodstream penetrating cell membranes without damaging normal human cells, Ongoing research is demonstrating the powerful killing effect of oxygen-silver hydrosols against pathogenic germs, bacteria, viruses, and fungi. 10) Due to the possibility that some beneficial intestinal flora might be, likewise, killed, the use of raw organic diets containing ample enzymes, probiotics, or enzyme and probiotic supplments, are generally recommended, especially for those rare persons experiencing digestive irregularities while taking this or any nutritional supplement or chemotherapeutic. 11) OXYSILVER™ is correctly classified as a trace mineral water that supports the immune system. It is not a drug. 12) OXYSILVER™’s unique electro-chemistry fulfills that of a silver hydrosol. The electro-chemistry primarily targets gram negative (negatively charged) anaerobic germs–that is, most pathogens. This is due to the exclusive manner in which Silver is covalently bonded to Oxygen creating this molecular polarity attracting and killing BigPharma’s microbial money-makers. 13) In addition to the manufacturing processes used to create scientifically proven silver hydrosols, OXYSILVER™’s manufacturing process includes special proprietary steps imparting beneficial energy signatures held in the geometrically structured water used in production. 14) OXYSILVER™ is proving to be a major advancement over historically proven silver colloids. * It should be noted that the special “reactor” that manufactures OXYSILVER™ is not a nuclear reactor as used in nuclear power plants, There is no radioactive pollution in the water of this hydrosol assuring no chance of radiation damage of any kind. WARNING: DRINK PLENTY OF PURE WATER BEFORE STARTING YOUR DAILY REGIMEN OF OXYSILVER HEALTHGUARD FOR IMMUNE SUPPORT. ADEQUATE HYDRATION AND OXYGENATION PRODUCES EASIER AND SAFER DETOXIFICATION! Also, USE ZEOLIFE, EXCLUSIVELY DISTRIBUTED BY HEALTHY WORLD AFFILIATES. DO NOT ACCEPT SUBSTITUTES. Spring water is most reliable for daily hydration while distilled water is considered best for detoxification and elimination of pathogenic components that circulate in the blood and lymph. Potentially massive die off of disease-forming germs should be expected within minutes to hours of beginning use of this product. Mild to moderate symptoms of detoxification, including headaches, malaise, fever, and skin rashes must be anticipated due to this product’s unparalleled and broad spectrum of action and strength, especially when used by persons whose immune systems have been compromised by previous medications and lifestyle risks. In this case, it is wise to use this product with available professional support, guidance and encouragement by qualified natural and nutritional healing professionals is recommended. Do not ask your medical doctor about OXYSILVER™ unless they respect natural healing. Most medical physicians know little to nothing about oligodynamic silver hydrosols, oxygenating therapies, or even nutritional prophylaxis. The really biased ones are likely to tell you all of this is nonsense! Sad that so few keep up with advancing science. Click here to place your order for OXYSILVER™.